DQLABS Students Work Documentation: Sruthi Singh, Gawhati. please submit your pending theme sketch and answer mocktest 4. Attempt Mock test 3 an 4 all questions and submit. Task 1 sketch a theme of farewell part celebrations in an auditorium. submit 2 different views with complete detailings and shading. submit the other them sketch too. 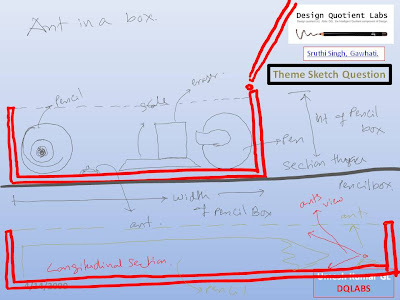 complete the theme sketching questions of test 1 and 2 . submit htem by 19th April before 5 pm. Answer mock test 1 & 2 and submit. Task 1 -Draw and shade a pespi 2 bottles in ants eye view and birds eye view using the perspective concepts . submit the above drawing by 17th april 2009 before 5 pm. i have sent you some basic perspective exercises. do them and submit. create a new, different composition with 3 6 0 use 3 hues to color it. submit the above 2 assignments by 16th April 2009 before 5 pm. Task 1- reattempt the ant in a box question based on the following instructions. use only pencils or any other medium ( black monochrome) donot color.. Task 2- create a 3d composition using a cofee mug, 2 big books and a computer mouse using peincils or any other medium. do not color it. Task 3- compose a 2 d drawing using number 3 6 0 . color them with any 3 colors. submit your drawing by 15th april 2009 before 5 pm. Sir, Incase of monochrome can we also use black watercolour? if using that particular color will give the required wow effect....then Yes, you can use. however you will have to follow the instructions given in the question paper carefully. i mean if the q paper says use red monochrome, and if you use black then you are in a fix. Sir, could you mention few common objects for practicing different perspective views. sir, could you mention few common objects i need to practise for different perspective views. similarly you can think of objects seen in a drawing room, bedroom, and public places like library, labs, etc. sir, in the question regarding the giant wheel, i cannot figure out how to potray the mob and the crowd. Sir, Ive corrected the ants eye view for the kitchen only the sketch in pencil, could you have a look. Sir i have few queries regarding the size of the sheet we would be provided for the drawing part of the test in AIEEE and NATA as well as the time alloted for it. Because i think i'm running out of time. size alloted will be of a4 or little bigger than that. you get approx 30-45 mins per sketch. you will have to be swift in answering the sketches, removing the unncessary delays....spend 3-4 mins planning your sketch ...allot time for each activity like 2d drawing - 15 mins, coloring 20 mins etc and ....and keep an eye on the time....plan your sketching.....that would help. Sir, wat abt my assignment for today?? hey !!! luv ur wrk .... keep it up !!! hey shruti ur skethes r too gud..plz call me na on 9766329650..i badly need you help.i have my nata exam in 4 days.plz do text or call me on 9766329650.thanks.